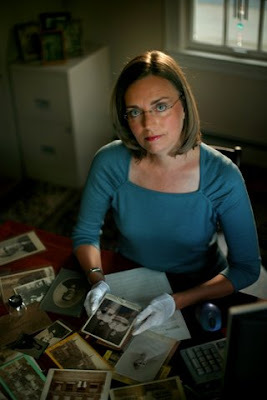 After six years of researching and writing about members of the Revolutionary War generation who lived long enough to be photographed, i.e. 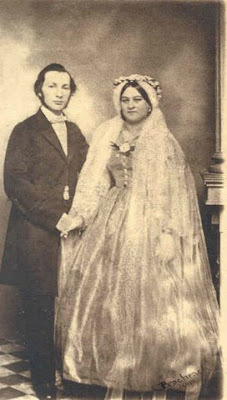 after 1840, I’m focusing my spare time on one of my collecting interests—weddings photos. See Projects. I’ve been slowly building a collection of wedding portraits because they tend to be a little (!) more expensive than your average family photo. Digital collections are helpful. The Library of Congress has a nice group of various wedding pictures. 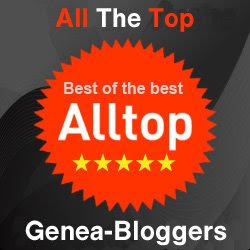 Attendees at my lectures and readers of my blogs also volunteer images. The Revolutionary War project sidetracked my collecting of wedding pictures for a while, but now I’m back at it. My collection ranges from c. 1860 to the mid-twentieth century. I’m always looking for all sorts of weddings from theatrical depictions to the average bride and groom. Several times in the last decade I’ve written proposals for a book on wedding history and approached commercial publishers. Don’t you think all those new brides would be interested in the traditions of past generations and love to look at old matrimonial photos. Nope! Not a single taker. Now I’m seriously thinking about self-publishing on the topic. I have files, books and electronic files all in preparation to start laying it out plus I have some great photos. Over the years I’ve written articles on the topic. For a couple of years I even wrote about contemporary weddings for a fashion magazine. (It was a lot of fun to interview living brides!). I think of these pieces as preliminary work towards a book. I’ve included a list in the bibliography at the end. Here are some pictures from my collection of wedding photos. The earliest photo in my wedding collection is this couple from the 1860s. It’s a paper print. (I’d love to have a daguerreotype of a bride, but those are very far out of my price range. Gazing at them in auction catalogs will have to suffice.) In this photo the couple’s formal attire signifies a wedding. She wears a wreath on her head, a veil and a gorgeous dress. A corsage is pinned on her bodice. Her husband wears the long sack coat popular at the time and a white tie. A chance discovery at a photo show yielded this great image. Doesn’t it look like she’s just wearing a nice dress? Well, it’s a perfect example of how not every photo of a woman in a white dress is a bride and not all brides wore white. 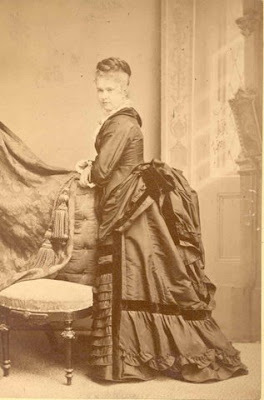 On the back is written, “Aunt Ella in her brown corded silk wedding dress 1876.” No way could she sit down with that bustle! In 1876, this bride wore brown to show that she knew what was fashionable for weddings. It’s my favorite picture. I especially like the fact that she’s a blonde but wore a brown hairpiece on the top of her head. Color coordinated hair?! 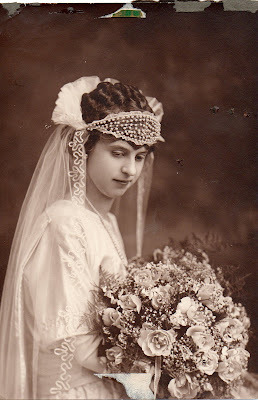 I have a lot of photographs of brides from the 1880s and 1890s. 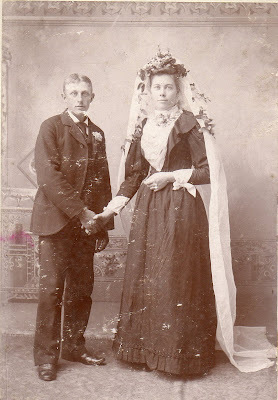 Most are not in traditional wedding gowns instead they’ve accessorized with bridal details such as white veils and flowers like this young couple from the late 1890s. The bride definitely looks older than this groom! 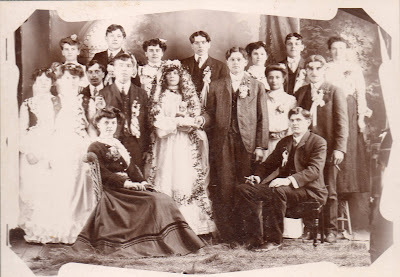 I think this tintype from the 1880s depicts a wedding. Jumping the broom (note the broom on the floor) was a wedding tradition in African American families and also some European families. Can’t imagine what the significance of the broom is, if this isn’t a wedding. I really like the fact that they are smiling; caught in a private joke. I’ll leave you with two (o.k. three) more pictures. I’m still investigating the significance of faux weddings with children called “Tom Thumb Weddings” after the famous nineteenth century personality. There were trends in wedding photos from portraits of a couple to those that I consider glamour shots of the bride. Then there are the photos that seem to include the entire extended family. Obviously, I could go on and on about wedding photos. Had enough? Sources: All photographs in this article are in the collection of the author. 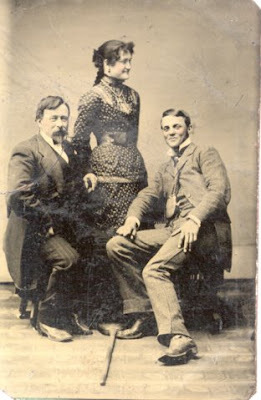 Image 4: “Unidentified tintype.” Collection of the author. Image 5: “Unidentified.” Seaver, Hyannis, Mass., c. 1901. Collection of the author. “For Love or Money?” American Spirit (May/June 2004), pp. 40-43. “My Big Fat Vintage Wedding.” Family Tree Magazine (June 2003), pp. 34-39. “Wedding-Bell Clues, Photo Detective, Family Tree Magazine (December 2003), p. 66. “Wedding Favors” Photo Detective , Family Tree Magazine (June 2006), pp. 72-73. “Wedding Photos to Have and to Hold,” Ancestry Magazine (May/June 2002), pp. 16-21. Love this article! I also like the idea of a book with all these pictures in it! Thanks so much! Thanks for confirming that not all brides wore white ca 1898. It's hard to convince others of that sometimes. Loved this post! You must go on with the book. This would make an excellent book! I love how they're smiling in the fourth tintype. I've also never seen a "Tom Thumb Wedding" photo (I'm still newer at this). This is a really great post. Thanks! These are stunning pictures. Love the wedding ones. I'm so glad you like these pictures. There is something so special about a wedding photo! Neat collection! I'm surprised you haven't found any interest for the book - sounds like a great item for photography collectors, wedding planners and historians alike. Stick with it! Yes, I like the one where they're smiling the most, even though the dynamics of such a trio is hard to discern. I would love to know the mechanics of how such a shot was taken. Were long exposure times no longer a consideration by that point? Maybe they just kept their smiles for a while, but they look like they're pretty spontaneous. Who knows? It's all great. Thanks for sharing. Super presentation of wedding pictures. Re: Tom Thumb weddings. 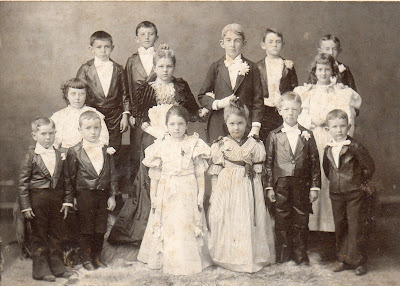 When I was a child in the 1940s in rural Mississippi, Tom Thumb Weddings were annual events at schools --- packed auditorium of paying papas and mamas to watch their little children dressed up as adults having a fake wedding. I attended several and was "in" one or two productions in the mid-1940s. Massive productions; good fund raisers! That tradition of Tom Thumb weddings seems to have been replaced with "Womanless Weddings" where adult men of the community dressed as women and that too attracted large crowds of paying customers for fund raising! Today some communities have evolved this practice of cross-dressing into "Womanless Beauty Reviews" playing to huge crowds of paying customers --- all good fund raisers for schools and community groups. And I think fund raising was the major purpose of the Tom Thumb Weddings of yesteryear --- easy to produce, cast of hundreds (wedding guests, excessive numbers of brides maids and groomsmen, etc), inexpensive to stage, and packed house of relatives willing to pay to see little Susie and little Johnny be in a wedding. Ah! There were also weddings without men where the women dressed like men. Isn't it all fascinating? Thank you for the information on Tom Thumb weddings. Hi, I love your site! The photos are wonderful, I really like looking at the pictures and wondering about their lives and who they might have been. Such a great work of history. Womenless weddings? That's wild! I could imagine menless weddings, as we're generally not big fans, but womenless? ha ha. And only decades ago really. What a great history!